Accademia Romana Kendo commits, through the study of sword's (katana) techniques, to create a community made by passionate of every age, which recognise themselves in the values of humility, sacrifice and respect for the others, also and especially, of the opponents. The experience of Kendo is a stimulating travel, with hurdles and trials to overcome with diligence and dedication, in order to obtain improvements and satisfactions, in the long path to become better individuals, also in everyday life. 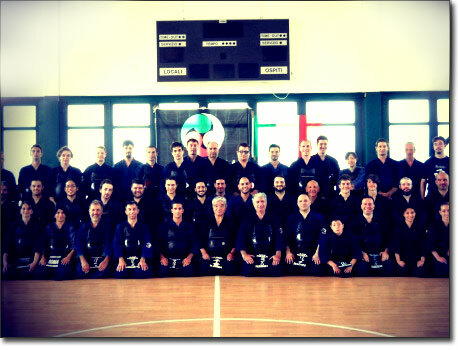 In the picture above: Accademia Romana Kendo in the grand room of the Dojo during Master Chiba's stage..